God Picks you from the patch, brings you in, and washes all the dirt off of you. Then, He cuts off the top and scoops out all the yucky stuff. and then He carves you a new smiling face and puts His light inside you to shine for all the world to see! We had SUCH a great day today! We went to Bible Study at church this morning. I started a new study by Jennifer Rothschild and I think it is going to be SO good. Then I went to lunch with my friends Laurie and Amanda. (Chilis - yum!) Then I went to visit my old office and all my friends I used to work with. We came home for a short nap and it has been such a beautiful fall day (one of the very few we have had) so we FINALLY went and took some pumpkin pictures. I have been wanting to do this FOREVER! I think I got some really cute ones! Then we went by the mall and just walked around (it's an outside mall) and enjoyed the weather. I did find Harper some cute gold shoes at Gymboree for $8. I mean - every girl ought to have a pair of gold shoes, don't you think? (FYI - NWA: I took these pictures at the Methodist church in B'ville on Central. I thought it was a great place to take pictures and very easy to get in and out (and the pumpkins support the youth). There are also great patches in Centerton, Lowell, Pea Ridge and SW MO - and probably others I don't know about). So so so cute!! I love her cute dress! Awww Kelly, she is precious! You have such a sweet little lady! Love her festive dress! I love your comparison of being a Christian to a pumpkin. I never really thought of it like that. We took our little boy to the pumpkin patch this weekend and got awesome pictures. Gotta love fall. Precious pictures! And I love your analogy of our christian walk to a pumpkin patch!! cuteness. I need to take Lauren to a pumpkin patch asap! And I'm loving the gold shoes idea! Love these pictures, so cute!! Gold shoes? I would LOVE to have some gold shoes! I just want to eat her up!! I saw the pics on FB and just wanted to squeeze her CUTE face!! I LOVE the last 2 pics that you have on this post! WoW...stinkin' adorable and as precious as could possibly be!! Glad it was such a wonderful day. Sounds like a busy but super fun day! You've inspired me to visit the pumpkin patch, too. And yes, every girl must have gold shoes. Duh! Hope the bible study proves to be a growth experience for you. Oh my word at the cuteness! I never thought about being a Christian and a pumpkin in that way. What a cute way to think of it and to explain it to a child. the pics are to cute. Too cute. I'm from NWA too, where did you go. I would love to take my kids to a pumpkin patch, but not sure where they are. I LOVE the pumpkin patch pics on American blogs- makes me want to come over for a visit! We're having a sunny Spring here in Queensland Australia. Oh...what a cute little pumpkin girl! Such an adorable smile in the last picture. Too funny, my blog post today was titled the exact same thing! Yes the book that goes with that analogy is called the Pumpkin Patch Parable. At my kiddos preschool they have acted it out before with a farmer carving the pumpkin and the whole bit!!! You MUST get it, although it sounds like you may already have it???? Such cute pictures in the pumpkin patch!!! Just adorable! I love all the monogrammed outfits you have for Harper. They are fabulous! What a great analogy!! Love that. Your little one looks adorable. Those are the sweetest pictures you have ever posted! I'm so glad that your day was wonderful. For selfish reasons I was really hoping that you would share with everyone where you took your pictures. I am a member for FUMC in Bentonville and we would love to finish selling all those pumpkins to better fund our youth activities. Love your blog and Harper. ohhhh that last picture is darling!!!! She is adorable and so is her jumper! I really liked your pumpkin analogy too. So true! I just love these photos! Precious Precious Precious! Darling Darling pictures, and A SWEET poem to BOOT! love pumpkin patches! Lurker coming out....I love the comparison and will be thinking of that for the next week! Harper is just adorable and kissable and your family is so blessed to have each other! I have been reading your posts and praying for you since I found a link when Miss Harper was born. May God keep blessing you manyfold! A girl can never have too many shoes! Adorable pictures! Very insightful of you! And very true! Harper is just precious! There is another book called the Pumpkin Gospel that tells the plan of salvation using a pumpkin (and it glows in the dark!) Written by Mary Manz Simon. It is a wonderful poem book and easy to read to young children. My pre-k and kind kids love it! Love Harper's outfit! 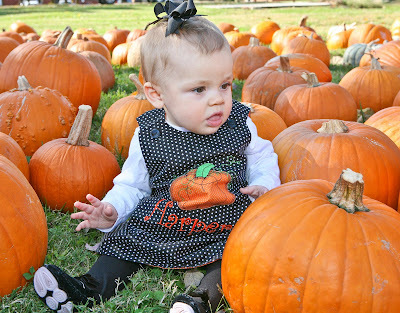 First of all, I LOVED the pictures of Harper at the pumpkin patch. So precious! Secondly, great analogy about Christians and pumpkins! So very clever! Your light is truly shining, Kelly! So cute! We love the pumpkin patch! There is a really cute series of books out by Liz Curtis Higgs that you may want to get for Harper- The Pumpkin Patch Parable is one we use every year when we carve our pumpkin. She has a book for each season. Love the comparison. Harper is looking cute as usual! Harper has to be the most fashionable baby EVER!!!! I love that dress! She must have a closet full of adorable clothes! Love the 2nd to last picture....I think it's the best! I loved this post Kelly. Not only is Harper just as cute as ever...that smile just melts my heart...but the words you wrote were priceless and SO TRUE!!! You sure do have one cute little pumpkin!! I was just thinking aloud to my husband at what a doll Harper is! But I only said "She is such a doll baby." Britt was walking by my laptop, and looked. He said "Who is that?" I said "Harper." He thought for a minute and said "You mean that is BABY HARPER?!" You see, when Harper was in the hospital in January, my husband, and both our kids prayed for and talked about "Baby Harper" like she was a member of our family. He said "She is beautiful. I can't believe she's that old. I remember us praying for her while she was in the NICU, twice the size of all those other babies." :-) You, Scott and "Baby Harper" are in our prayers still. We have loved watching her grow! Thank you for being such a great witness for the Lord on your blog. What Jesus has done for us truly is amazing! I am in a women's bible study at my church and we have been doing the Jennifer Rothschild "Me, Myself, & Lies". It is awesome!! Harper is so adorable. I love her pumpkin dress. This was a fantastic post! I love the comparison! I have never commented here before, but I want to thank you for your encouragement and faithfulness. I started following when Harper was born. On another note, I love the shopping sites you list! They have great stuff! What a big girl standing up all by herself! She is def. the cutest pumpkin in that patch! She is such a doll!!!!! I cant believe how fast time has gone...she is growing up way to fast. Girl you really know how to pack a day! Bible study, lunch, nap, & pumpkin patch all before dark??? Kelly, I knew the pumpkin pictures had to be coming soon. I have been watching every day and they are just precious. The dress is so sweet, but that sweet baby wearing it is just beautiful. God has richly blessed you! Love your entire post! Great pictures and what a wonderful story of what God does for us. So thankful for the beautiful weather this week. Great post!! And so true too!!! They turned out great! And look at her standing up! She's gonna be walking in no time! Ahh she's adorable in her little dress. I love pumpkin patch pictures! Awesome pictures! You had a busy day. Sounds fun though. Love the poem. Thanks for sharing the beautiful analogy! LOVE IT!! Cute pics,too!! I was the only child out of six that had an unusual name so I never got anything personalized when we went on vacations (license plates, patches, etc.) ~ so I am known for personalizing everything of my kids ~ but, I think you have me beat! Love it! L.
She looks so cute! What an adorable dress! So adorable!!! And I love the poem. Loved the metaphor. It's so true. She is such a cute lil pumpkin! And i LOVE LOVE LOVE the poem! <3 So true!! Hi Kelly, So glad you finally got to the pumpkin patch. But Miss Harper was the cutest pumpkin there. The last picture is adorable, what a smile! And every girl needs a pair of gold shoes. You never know when you will be asked to the ball. And the pumpkin patch analogy was great. that is a cute poem, and such a great, unique way to put in perspective God's love. I love the dress, and those are the best pictures! 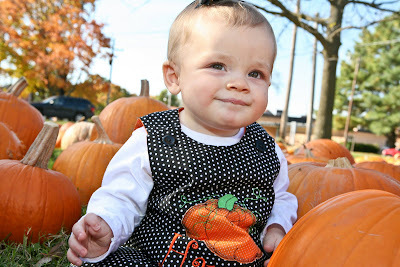 I think I put on some else's blog that I look forward to the day when I take my child to the pumpkin patch! It upsets me alittle to know that I won't be able to take my son, but I know that he is in a better home than I could have given him. So I'll take solice in that. That's a really great metaphor. Also, the pictures of Harper standing are so darn cute. She's getting so big. Love the pumpkin analogy... sooo cute ... and so is ur lil pumpkin Harper!!! Great poem and great pumpkin patch pictures! 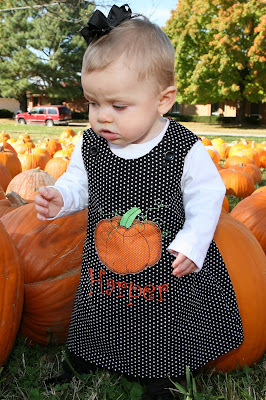 Love the poem & Harper's pumpkin dress....so adorable!! Just adorable as always! And I love Jennifer Rothschild...we did one of hers last year and it was so good-everyone in our group felt the same. Happy Autumn! Kelly--Jennifer Rothschild is one of my FAVORITE bible study teachers! ! I ADORE her!!!! She is wonderful and you'll LOVE her! 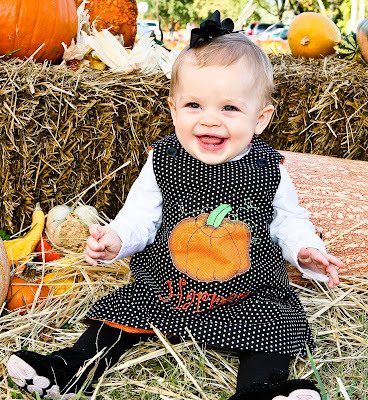 I love Harper's dress and the pumpkin patch pics! Very Cute! Oh and I liked the poem too! I love that pumpkin poem - Thanks for sharing it again. What a great reminder of God's love! Your pictures are great! I am so glad she got to go to a pumpkin patch. We are going this weekend. Very cute pics and cute dress! Does Harper own much without her name??(hehe!) My sis would buy some things from you, but her daughter's name is Ella Claire, and her son's name is Harper! Extra cute pic's..we are going to take our two this weekend. Oh bless her! What a beautiful little girl she is! 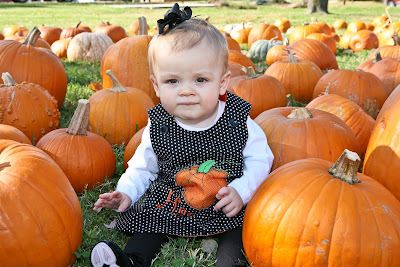 Little Miss Harper is precious in the pumpkin patch, Kelly , you did good taking these pictures . The pictures are adorable!! She is getting so big! I also love the poem! I have recently started reading your blog and enjoy your posts and your precious pictures of Harper. I just want to let you know that I appreciate you and your love of the Lord - You have been blessed with that beautiful little girl. Thanks for all your fun posts. I do have to say I am not loving your football team cause I love the Gators - but I know you will come around :) haaa! Anyways thanks for your blog- I look forward to meeting you someday here in Georgia :) Take care and God Bless! Thanks for telling the world where you got your pumpkins! I know that your suggestion will help our sales exponentially! Have a great day. Harper just gets cuter and cuter!!! Hey, Kelly. This book is one of our fall favorites...it's the pumpkin patch parable. Definitely worth adding to your collection! So cute! I love the dress! It sounds it was a fun day! Harper just gets cuter and cuter every day!! LOVE THIS!! Thank you, Kelly, for sharing! Harper is precious...as always! HUGS!! I love the poem and Harper's dress is fabulous! I think Harper gets more adorable everyday...if that is even possible!! Oh my word - that last picture is priceless. I remember when I did these with Kennedy at that age - so much fun. This year she was more interested in the near by play area and not so much about sitting in the pumpkins which made me kind of sad. Glad I got to share sitting in the pumpkins with Harper - so sweet! I love that verse and I love that dress! Fall is such a lovely time of year with all the fun things to do. Darling! Remember when you did this for E at the same place and age???? LOVED the pumpkin poem comparing it to being a Christian. It is so true of our Lord. Harper is such a beautiful little pumkin! I love reading your blog. Harper is precious and I just love her dress! Precious! I love the pumpkin poem!!! :) Harper is such a lil doll!! Oh Kelly! That last picture of Harper is precious. What a little doll! I'm glad you finally got to go to take pictures at a pumpkin patch. I know its something you've dreamed of doing for a long, long time- taking your baby to a pumpkin patch. Oh my! The pictures are adorable. She is just the cutest. I loved the Pumpkin Poem, I honestly needed prayer this morning, I have been going through some things, and yours hit me harder than the other's this morning. Thanks for sharing. Have a great day Kelly! Get the chldrens books that everyone is recomending to you....Pumpkin Patch Parable by Liz Curtis Higgins. They are great, the Easter one always makes me cry at the end!!! Can I just take Harper home? Pretty please? She's so adorable! It was a great analogy! 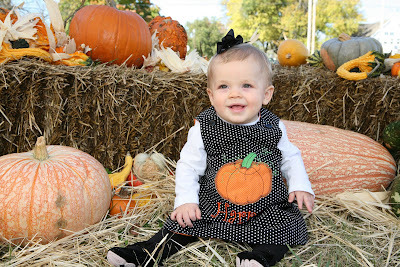 LOVE all the pic in her pumpkin dress! I love how Christians can use everyday occurences to share the Love of God with other. What adorable pictures, she is such a cutie pie!! And what a great analogy! Great poem and such a pretty pumpkin as well! I just realized that you seem to live in the same town as my aunt and uncle! What a fun time! I love her dress! I love Harper's cute little bows, but I have to admit...I miss her huge bows!! She is too cute!! Allikaye has a Happy Pumpkin book that shares that little pumpkin poem! Puts such a great perspective on the halloween fall time...instead of the worldly view! Love it! And those pictures!!! Love!! Harper certainly is a little little light! I know she lights up your life!!! I LOVE the last picture...beautiful! The dress is precious! I ordered Cilla a pumpkin dress a few weeks ago and it is still not here! It may be here in time for Christmas! Love the comparison between pumpkins and God's Chosen People! How appropriate and accurate! I love the pumpkin analogy! Precious pictures! I love the poem too! It warms my heart to see you treasuring every moment with Harper and watching you make your dreams come true. Thank you for continuing to share each and every day. IT's great to follow Harper and watch her grow!!! Precious!! She's getting so big-it must be flying by now that she's mobile! My two year old little boy, Dagan, walked up as I was reading your blog and he said "Hey! Cute Baby!" I thought it was adorable!! So cute. I love her little dress! Harper's little outfit is so cute. I officially give her the award of "Best Dressed Baby Girl"! ha! Love the pumpkin pics especially the last one! Love Harper and the pumpkins! I can't until the day I can take kids to the Pumpkin Patch! Maybe next Fall will be my turn!! Also LOVE The pumpkin poem!! I am going to "Steal" it and post it on my blog!! After all those months and years of waiting, there is your sweet lil' punkin' at the Pumpkin Patch!!! What a dream come true! I love it!! She looks so cute! So glad you had a good day! We went to the pumpkin patch tonight and had a great time, too! I didn't really get a chance to talk to you at the Selah concert. I wanted to let you know how much I appreciated you taking the time to pray for Sarah. She's had quite the journey, but I know God has a special blessing for her in His timing. Your journey with Harper was truly amazing, inspiring and I know has changed many people's lives. It was such a pleasure to meet you! I must tell you quickly - a dear friend of mine, Martha Burks, read my blog, then sent me an email that she went to college with your mom and they still stay in touch. What a small world! I am a "small" blogger, but I posted the pictures of you, Sarah and Angie on my blog and thought I'd pass them along to you. I was a little late getting them up, but they are on the Oct.11 post. Thanks again for praying...this Friday is an important day, so extra prayers would be appreciated! Harper is adorable is always! That was a good analogy. I can't wait to use it on my kids someday when they are older! I am going to use that for the children's message on Sunday. I have never done the short message and this is perfect for it! Love the pumpkin patch pics! She looks so happy with the pumpkins! Great pictures! I love her outfit! Loved the pictures of Harper. Love you and your beautiful heart!